Mogul Khan, the Axe, relishes the chaos of battle and war. He is always eager to jump into a fight, taunting foes around him with Berserker’s Call in order to get them to focus their attacks on him. All the while, he answers back with deadly force through his passive ability Counter Helix, which deals a hefty amount of area-of-effect damage to those that dare raise their blades against him. He is also able to curse his enemies with Battle Hunger, dealing damage over time and slowing them down until they kill a non-friendly unit or the duration ends. His signature ability, however, is what truly inspires fear among his adversaries. With the force of a thousand warriors, Axe brings down his mighty weapon upon an injured opponent’s neck, killing them instantly if they are under a certain threshold in terms of health. If successful, Axe’s teammates also receive a movement speed bonus. This killing stroke of his is called the Culling Blade. Axe’s entire kit thus makes him perfect as an initiator, preferably as a position 3 or 4 hero in your draft. With a Blink Dagger, he can quickly close in on unsuspecting targets and use Berserker’s Call, while the rest of his team helps clean them up with their own damaging abilities. If that plus his other skills aren’t enough, he can use Culling Blade to finish stragglers off. He does, however, require a bit of farm to be effective—primarily because his core items are quite pricey and he becomes prone to getting blown up by magic damage nukes without the proper protection. Fortunately, Counter Helix helps greatly in this regard, as Axe is able to farm neutral creep stacks and large creep waves effortlessly with it. With enough gear in his bag and a good amount of game sense, Axe can be the driving force behind your team’s push to victory. Convinced? Read on to find out what you should do in order to make the most out of him. Axe’s ability progression isn’t very difficult at all to figure out. Back then, the first skill point would pretty much always go to Counter Helix in order to enable jungle farming from Level 1—but now that the jungle isn’t as lucrative as it used to be, it’s just not worth sacrificing the offlane for it. 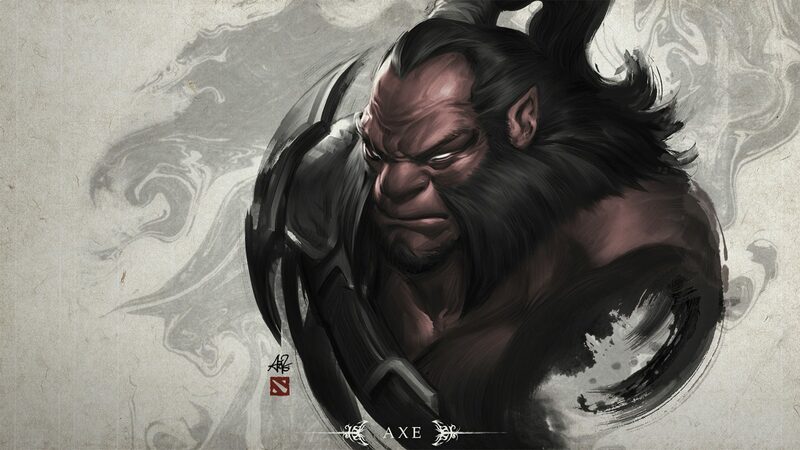 Instead, Battle Hunger should receive the first point, to enable Axe to harass his lane opponents at range. One point each in Counter Helix and Berserker’s Call should be next after that. Berserker’s Call should be maxed out first, in order to optimize its disable duration as soon as possible. Counter Helix pairs perfectly with it, so it should be the next priority. Together, both of these abilities allow Axe to solo kill certain heroes—provided that luck is on his side with the Counter Helix triggers. Of course, Culling Blade should be taken at every turn, because of its great scaling per level. Also, the higher levels allow you to use it on less-injured targets, thanks to the higher thresholds. Battle Hunger is the last priority for the opposite reason: its scaling isn’t really that good and it’s not something that helps you snowball in the mid game all that much. To start with, Axe should purchase a pair of Tranquil Boots for himself. Since Tranquil Boots can be dropped during combat (for instance, while farming jungle creeps with Counter Helix) and picked back up to immediately receive the health regeneration, it makes life in the early game a lot easier for him. They also allow him to stay out on the map for longer, rather than going back to base just to refill. An initiation item of some sort is always required, no matter what draft it is your team is up against. Blink Dagger is the ideal choice, thanks to its instant cast animation and long cast range. Force Staff is a viable alternative against lineups that run a lot of damage over time spells, which prevent Axe from using Blink Dagger to initiate, chase, or escape. Force Staff also has the added benefit of increasing Axe’s smaller-than-average mana pool. The initiation item should be followed by a Vanguard purchase, since it helps mitigate any incoming damage while enemies are trapped under Berserker’s Call. The extra health is the icing on the cake. Later on, the Vanguard can be upgraded to a Crimson Guard, which gives your teammates more survivability too. Blade Mail should be next after Vanguard, as it allows Axe to leverage his tankiness by further punishing enemy heroes for using damaging spells on him. In the late game, Black King Bar will likely become necessary as well. Axe is at his best when he is able to move freely around the area during teamfights, chasing down key targets and keeping them off his teammates. BKB allows just that, by letting Axe shrug off all but the most potent of disables (those that pierce magic immunity, in other words). In deep late game scenarios, things like Shiva’s Guard, Heart of Tarrasque, and even Heaven’s Halberd make Axe a more oppressive force on the battlefield. Shiva and Halberd in particular are great against right click hard carries, while Heart allows Axe to recover his health quickly for the next engagement. Axe’s ability combo is simple: Blink or Force Staff into a group of enemies (the more, the better), then immediately cast Berserker’s Call. Since the latter disables targets even through magic immunity, it should preferably be used to do so against enemy heroes that have already activated theirs. This wastes a lot of time for them, and allows your team to better pick their spots in the engagement as you peel magic immune targets off. Once a target’s health goes down sufficiently, finish them off with Culling Blade. Repeat for the next targets, since successfully decapitating someone with Culling Blade resets the ability’s cooldown. Use Battle Hunger if necessary, to slow fast-moving heroes down and/or disable enemy Blink Daggers. And that’s it, really! Heroes that interrupt Axe’s flow in combat or remove him from the battlefield outright work great against him. As mentioned above, damage over time effects like what Venomancer and Viper can apply annoy Axe to no end, since he is dependent entirely on positioning to be effective. Banish effects such as Outworld Devourer’s Astral Imprisonment or Shadow Demon’s Disruption help save teammates from Berserker’s Call and Counter Helix. For the former, though, Arcane Orb also deals with Axe well, as it cuts through his armor and shrinks his mana pool simultaneously. Doom is also another fantastic choice against Axe. Infernal Blade deals damage based on a percentage of the target’s health, which means that Axe, with his above average health pool, will suffer greatly from it. Doom (as in the ultimate ability) also prevents Axe from doing anything useful, other than walk around hoping to get some Counter Helix procs in. Timbersaw counters Axe in a similar fashion, thanks to Whirling Death’s attribute reduction mechanic. You’d be surprised just how much health Axe loses when he gets hit by it. As for carries that Axe hates to go up against, Ursa and Lifestealer are at the top of the list. Enrage makes Ursa extremely durable when going toe to toe with other heroes, while Fury Swipes ensures that Axe will start to take huge damage per hit eventually. Lifestealer’s passive ability Feast deals bonus damage to Axe based on his health, and returns it as healing to Lifestealer. Remember: heroes under the effects of Berserker’s Call are rendered unable to act in any way, and are automatically given an attack command directed at Axe himself. Use it to disable dangerous foes, such as those that can lock your teammates down with crowd control abilities. Other than that, however, there isn’t much else to say about Axe. He is there to arrive, raise hell, make heads roll, then raise hell again. If your team is in need of magic immunity-piercing initiation on a reasonable cooldown, look no further than Mogul Khan himself.